He relies on his subjective feelings which he believes are being directed by the Holy Spirit to make decisions about where in the Bible he is going to study. This removes the ability to utilize proper hermeneutics. When he does this, he can’t have the broader context needed to harmonize scripture with scripture. This mystical decision making process is abiblical. After picking the book of Numbers to study from, he skips the importance of the genealogies because he believes them to be tedious and boring. I wonder if he knows what theopneustos means? At about 8 minutes and 16 seconds in he claims he makes it a habit to not teach things that are new for about a year, and that he sits on them, but of course he is going to break his own rule and teach a new teaching. What does the completely revealed finished word of God have to say about new teachings? At about the 15 minute mark Andrew starts doing what many other false teachers do, he gets a concordance out and makes a hash out of Hebrew to invent a false teaching that is not in scripture and then impose it on his listeners. He uses it to claim that God does not afflict people. I wonder if he ever heard of Pharaoh, Jonah, Job, or for that matter the curse God inflicts all of Adam’s progeny with? Just, wow!… We all know from reading the same scriptures that Andrew is twisting, that Moses is disgusted with the people, and their selfish greed, and entitled feelings. Leading them was a great burden. 20 minute mark he starts on again about getting impressions from God and just knowing things in our hearts. This is no substitute for what God actually says in His word. How does one know if the idea that popped into their thoughts was not just of their own imagining, or even worse some demon speaking to them? I know, let’s ask Muhammad, Joseph Smith, or Ellen G. White… NOT! He keeps abusing 1 Corinthians 10:11-13. I wonder what he would tell the martyrs? Don’t worry, the lions won’t eat you, the flames won’t be that hot… Come on… The intent of God in His word where He says, “God is faithful, and he will not let you be tempted beyond your ability” in context means that you can make it through any circumstance by God’s grace. He provides a way out of sin, so that you won’t have to sin while being beheaded burned alive, cut off in traffic, being left behind by an adulterous spouse, the death of a child. You can go through these things, and by His grace, choose to not sin. It doesn’t mean bad things will never happen to you. This is insane. This idea that the men appointed to help Moses was not from God is just more nonsense. Did not Christ have Apostles? Are the Churches to not have more than one Elder? 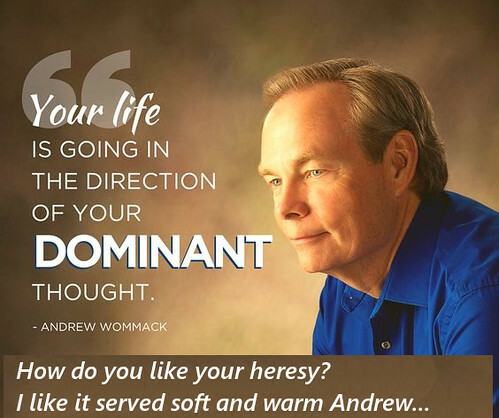 Come on Andrew… Stop making such a hash out of scripture. You twist it like it is free. One day you’ll have to answer for all your twisting. @ 26:50 he starts in again about suffering not being God’s will, and he is placing a tremendous works righteousness burden on the people listening to him, that he himself doesn’t even believe or perform. He preaches a, “life enhancement Christianity” that is just not true. We don’t have less suffering in our lives when we come to faith, matter of fact, we suffer for our faith, unless you don’t believe what God incarnate said in His own word. I can’t even begin to tell you how much it ticks me off to hear him talking about, “God’s best.” How does he know what is God’s best for you? We need to suffer. It is part of growing in faith. It is part of being sanctified. Again, what would this clown tell Polycarp while he was being martyred? “Oh Polycarp, you just don’t lay your burdens down on the Lord enough. You just aren’t using the faith God gave you. You need to try harder to be more spiritual like me because I don’t have any problems…” Yeah, right! Pack it in and go home Andrew before you hurt anyone else!!! Oh and say, let’s not forget the flood, or Sodom and Gomorrah, or plagues and famines sent as discipline upon the people. Andrew’s theology is so anthropocentric it is no wonder his doctrines are so focused on life enhancement through the faith he invented. In Romans 1 we can see God’s punishment in the form of people worshiping created things. This includes anthropocentric religion as well. Romans 1:21-25 “21 For even though they knew God, they did not honor Him as God or give thanks, but they became futile in their speculations, and their foolish heart was darkened. 22 Professing to be wise, they became fools, 23 and exchanged the glory of the incorruptible God for an image in the form of corruptible man and of birds and four-footed animals and crawling creatures. 24 Therefore God gave them over in the lusts of their hearts to impurity, so that their bodies would be dishonored among them. 25 For they exchanged the truth of God for a lie, and worshiped and served the creature rather than the Creator, who is blessed forever. Amen.” If your theology centers around man, you are an idolater. @30:43 Wommack’s god doesn’t control any of the negative things that happen to us. His god isn’t sovereign. ” 1 For I do not want you to be unaware, brethren, that our fathers were all under the cloud and all passed through the sea; 2 and all were baptized into Moses in the cloud and in the sea; 3 and all ate the same spiritual food; 4 and all drank the same spiritual drink, for they were drinking from a spiritual rock which followed them; and the rock was Christ. 5 Nevertheless, with most of them God was not well-pleased; for they were laid low in the wilderness. In verses 1-5 we see that the ones, who persevered in faith in Christ, were the ones whom God was well pleased with. The rest God was putting under discipline. Verse 6 is pretty self-explanatory. Don’t go after the sin that they went after, duh! The first group of sinners mentioned was the idolaters, then the immoral out of which God killed 23,000. Next were the ones who doubted and tried the Lord, He sent serpents to kill some of them. Then there were the grumblers, the ones who complained about God’s providence. God destroyed them with the destroyer, an angel sent to kill them in the desert. After reading all of this in addition to the verse that so often gets twisted, we can see that God is talking about sin here. In Christ, He has provided a way out for His elect. We can choose to not sin, in any given temptation because we are no longer slaves to sin, but to Christ. The Holy Spirit is in us, we are born again, made dead to sin and alive to Christ. When temptation comes, fight against it with the promise of the gospel, and a view of Christ’s sufferings on the cross on behalf of you, because of your sins. If you do that, you won’t want to add suffering to Christ so to speak, not that you could, but figuratively because as we know all of your sin, past, present, and future, was paid for over 2000 years ago by Jesus. I watched the rest of the video and there was more and more about God telling you what to do in some mysterious way, via a word, or prompting. It was getting tedious and sickening to hear him keep burdening people with uncertainty, when the Bible is so clear. People, IF YOU WANT TO KNOW WHAT GOD WANTS YOU TO DO, READ THE BIBLE!!! @ 38:20 He talks about his skin cancer, and how he is committed to healing, so he won’t go to the doctor over it. Now you know as well as I do, even though he told other people to do what they wanted in that regard, he made it sound like he was superior and the example, because he is committed to healing. Obviously if they decided to go to the doctor, they must not be. This is spiritual malpractice. He could be costing people their health with this pernicious nonsense. If this one lesson didn’t offer enough health and prosperity false gospel for you, don’t worry… He has many more available on youtube for me and others like me to correct. Please take care, and read your Bible. I agree with Andrew on that. Read your Bible apart from his teachings. Systematically study it from beginning to end. If you do that, and still agree with Wommack, I pray the Holy Spirit will correct you. Here is some more on Wommack. people who have come into this new gospel! what does Galations 1:6-9 “if we or an angel preaches another gospel…let them be under God’s curse”( paraphrased)! i’ve looked up dozens of scripture that in context is all about taking up your Cross! Thanks for God’s Word of truth! !